An Israeli army drone fired, on Monday evening, a missile at Palestinians, reportedly flying flaming balloons, east of Beit Hanoun, in the northern part of the Gaza Strip. Eyewitnesses said the missile exploded near several Palestinians, but did not lead to any casualties. 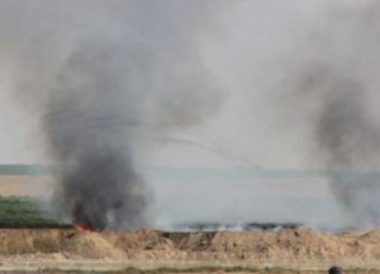 Israeli Ynet News has reported that a large fire broke out near Shikma area, close to the border fence with the Gaza Strip, and added that firefighters rushed to the area to extinguish it. However, the news agency added that it remained undetermined whether the fire was a result of the balloons flown from Gaza. On Sunday, Israeli sources said seventeen fires broke out in lands across the border fence, along the eastern border of the Gaza Strip. In related news, Israeli Prime Minister Benjamin Netanyahu, who visited Sderot Israeli settlement near the border with the besieged Gaza Strip, stated that the Israel would never agree with a ceasefire with Gaza, unless its includes stopping the flying of burning kites and balloons.